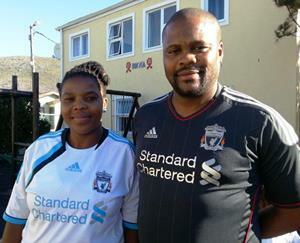 It is the aim of HOKISA to empower members of poor communities where HIV/AIDS is most devastating. No money is spent for office buildings or costly administration. 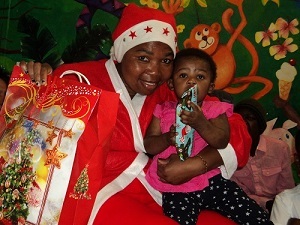 Donations go directly to the HOKISA Children’s Home and the care of the children. All childcare workers are residents in the same township community and have had the opportunity to grow and develop their skills. We understand this as a concrete way to promote openness around HIV/AIDS, and to educate against the stigma and denial around the disease by setting examples of effective care and honest communication. On December 1, 2002 (World AIDS Day) the first HOKISA Home was opened in the township of Masiphumelele, south of Cape Town, by Archbishop (em.) Desmond Tutu. This HOKISA Home was named by the community: HOKISA IKAYA LETHU – HOKISA OUR HOME. HOKISA was founded in March 2001 in Cape Town by Karin Chubb, then a South African senior lecturer at the University of the Western Cape, and Dr. Lutz van Dijk, a Dutch-German writer. The starting point was their common work in reporting on the youth hearings of the South African Truth & Reconciliation Commission (1996-98). Realizing that HIV/AIDS was becoming a more and more devastating threat to the people of South Africa and the new democracy, both decided to dedicate the royalties of their books on human rights and HIV/AIDS to projects for children affected by this disease. Since then, Lutz van Dijk has written more books published in South Africa, all royalties going to the HOKISA project. His novel Crossing the Line (Themba) has been made into a major motion picture. 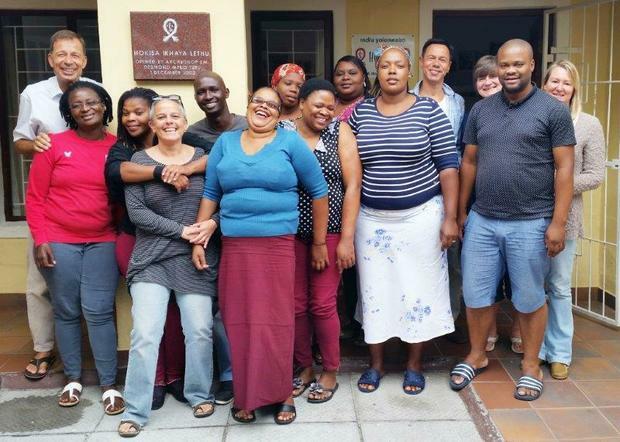 In March 2002 the HOKISA board endorsed the decision of the directors to create a home for children affected and infected by HIV/AIDS in one of the poorest communities in the Western Cape – the township of Masiphumelele, about 25 km south of Cape Town. The idea was to plan and build this home together with members of this community – and thus also to create jobs for at least some of them in the long run. 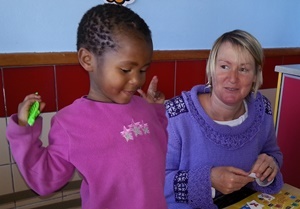 Already as early as February 2002 a HOKISA support group met regularly at the Day Care Clinic in Masiphumelele to decide on the character, design, building and finally personnel of the first HOKISA Home in South Africa. The Support Group was generally open to everyone from the community who wanted to contribute and could offer some experience and advice in the field of children, health care, education and/or HIV/AIDS awareness. Regular members were health care workers, teachers, nurses from the clinic, members of youth and women organisations and church groups. Sometimes also HOKISA board members took part in the meetings. This statement has become a guideline for our practical work: To do all in our effort to work against discrimination around HIV/AIDS and to support those caregivers who take responsibility for the children and speak out against stigma and denial of the disease. 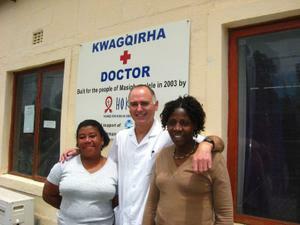 From 2001, Karin Chubb and Dr Lutz van Dijk served as executive directors in a voluntary capacity for HOKISA. In 2009 they handed over the directorship and day to day management of the organisation to Robyn Cohen, but continued to be involved as board members, directors and ‘grandparents’. In 2015 Robyn stepped down as Executive Director, but continues to be involved in the lives of the children, and now voluntarily represents HOKISA as a Director and Chairperson of the Board. In 2011 we added the skills and experience of a Social Worker, Susan (Sue) Purvis, to our team - Susan brings essential expertise and knowledge to HOKISA. Our Team Leaders(Eunice Mbanjwa and Mandisa Mahlumba), have both been with HOKISA since the start and have grown into their positions. The home is now run by a combination of the Directors (Perry and Robyn - with input from Lutz and Karin) and the management team of Eunice, Mandisa and Sue. HOKISA has been assisted from the start by HOKISA board members/directors, who are experienced in human rights work, education, labour law and HR, accounting, healthcare and community development projects in South Africa. They supervise the activities of HOKISA independently as volunteers. The HOKISA bookkeeping is controlled by our Financial Director/board member on a voluntary basis. > Philip joined the HOKISA team late in 2013. 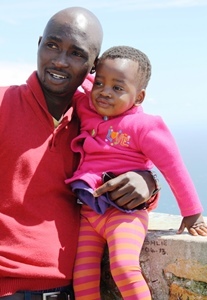 It is great to have another Bhuti on the team, and another driver… Philip has bonded with the children and has learnt a lot about HIV and AIDS. The children love going on outings with Philip and Philip shares lots of his pictures of these good times on our HOKISA Facebook page. > Nosisi joined the team in 2015 and she adds to the love and warmth that our Mama’s bring to our homes. Nosisi has won the hearts of our children, and the little ones love singing songs and listening to stories with her in the garden. > Fezeka is the newest member of our HOKISA family, who joined us in December 2015. 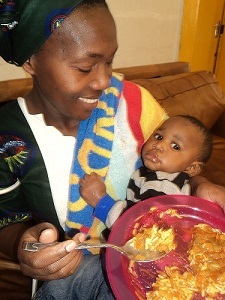 Fezeka is loving and caring to all of our children and she brings with her, excellent cooking and crafting skills, as well as patience and initiative. In 11 years [from 1997 to 2008], the rate of death has doubled in South Africa. South Africa is 0,7% of the world population, but carries 17% of its HIV/Aids burden… the country is 23-times the global average. 57% of children who died during 2007, died as a result of HIV/Aids. Lutz van Dijk: Crossing the Line. Tells the story of Themba, a rural boy who rises to become a player in the South African national soccer team, in spite of AIDS. Lutz van Dijk: A History of Africa. For young people; African history as told by African voices through the ages. Karin Chubb/Lutz van Dijk: Between Anger and Hope. South Africa’s Youth and the Truth & Reconciliation Commission. Lutz van Dijk: Stronger than the Storm. A novel for young readers about HIV/AIDS in South Africa. With a Teacher Guide by Karin Chubb. Dr Peter Jacka runs his private general practice from the grounds of HOKISA and we are privelaged to recieve excellent treatment, support, advice and consultation from him. Dr Jacka looks after all the HOKISA children as well as the HOKISA staff and their families. We enjoy weekly meetings with Dr Peter Jacka, where any medical concerns or issues are discussed and we are guided by his professional expertise and his commitment to HOKISA and the community.